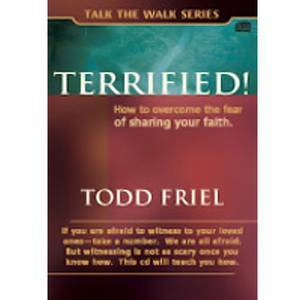 Are you afraid to share your faith? Does the thought of witnessing make you stammer? Then congratulations! You are qualified. Paul came to the Corinthians with fear, no eloquence and much trembling. If that sounds like you, then you are qualified to do the most compassionate thing a Christian can do . . . share the cure for eternal death. We live in a world of self proclaimed intellectuals, evolutionists, post-modernists and atheists, but you don’t need to be an expert in ANY of those areas. You simply need to know the Biblical principles for sharing your faith and you will be in control of every witness encounter. If you are a Christian, you know someone who is not saved. Please, overcome your fears for their sake. Let this Mp3 CD help you. Includes step by step study manual and Mp3 CD with 26 witness encounters varying from lapsed Lutheran to angry Catholic.